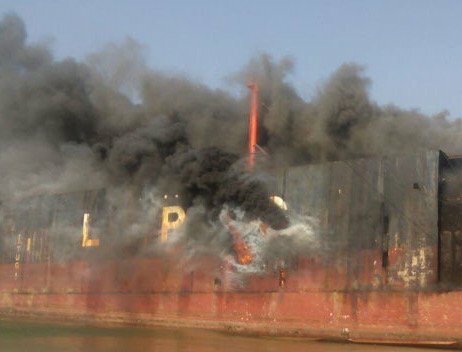 A large fire has erupted onboard a vessel at Pakastan’s Gadani shipbreaking yard, the same LPG carrier which caught fire after an explosion last month. Geo News reports more than 100 workers were on the vessel when the fire broke out, with 70 workers confirmed to have been rescued. There are not yet any reports of casualties. The latest incident is the third in under three months at the yard, the most serious of which occurred in November when a fire broke out on an FSO at Gadani raging for four days and killing a confirmed 26 people with more still unaccounted for.